DMP security panels already integrate with home-automation devices through the company's Virtual Keypad. At ISC West 2018, the company announced integration with Ring Video Doorbells. Ring video doorbell integrates with DMP security systems. 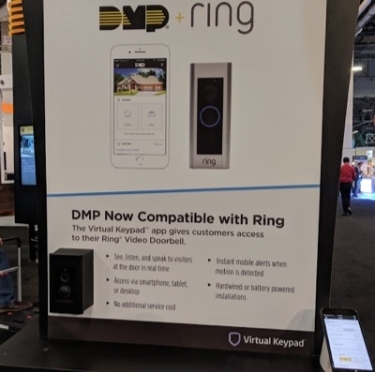 Alarm system manufacturer DMP now integrates with the Ring family of video doorbells with DMP’s Virtual Keypad app. The Virtual Keypad app allows end users to remotely control their home’s lights, thermostats, door locks, appliances, cameras and more along with standard features, such as arming/disarming, checking status, area arming and output control, according to the company. Customers can now add Ring Video Doorbell access to that list. When visitors press the doorbell or trigger the built-in motion sensors, the user will get an instant alert through the Virtual Keypad app. The user then has the ability to see, listen and speak to their visitors in real time with their smartphone, tablet or desktop. Compatibility with the Ring Spotlight and Ring Floodlight is coming soon. DMP added a slew of new and updated features to Virtual Keypad this past February, including a brand new user interface, a customizable arming screen with cover photo and much more. You can see a list of the updates at Security Sales & Integration, CE Pro's sister publication.